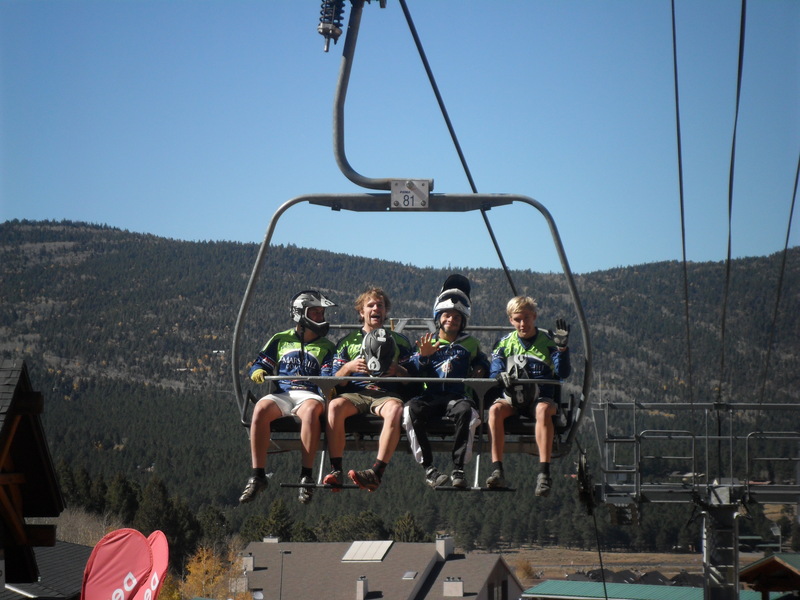 Two weeks ago our team set off to Angel Fire, New Mexico, for the 2012 Collegiate Mountain Bike Nationals. Hugh, Tim, Corey, Catherine, Alan, Tyler, Laura and I all met early in the morning and shuffled into the team bus for the long drive to the Atlanta International Airport. We arrived with time to spare and began navigating our way through security and eventually made it to our gate. Tyler was the only one of us to have never flown before and was freaking out about it. As we made our way onto the plane another passenger overheard the conversation between Tim, Tyler, and myself, telling Tyler to calm down, and gladly took it upon himself to play a cruel joke. Before we even knew it we were in Dallas/Fort-Worth. We grabbed a quick meal since we were only there about an hour until it was time to depart to Albuquerque. When we landed in Albuquerque the dark had already rolled in and all we could see was the city’s lights. We hopped in our rental van and three hours later finally arrived in Angel Fire. Laura Rice got a great start in the short track. Tyler and I woke up early before everyone else on Thursday’s practice morning and decided we would go check out the bottom of the downhill course. The downhill course ended leading us to the dual slalom course and eventually to the cross country course. We kept going up the mountain until we were near the very top. Neither of us had ever been up that kind of elevation so we soaked in the view. Eventually we headed back to the condo where we found Hugh, Tim, Corey, Catherine, Laura, and Alan building their bikes. We hurried to build ours so we all could venture out onto the course. When we started our ride it was in the mid 40s and blue skies. 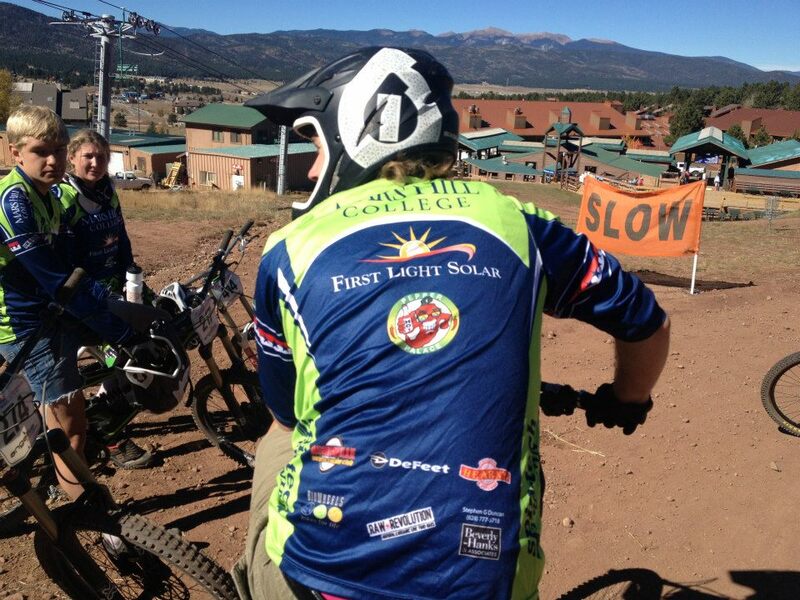 We saw a few other teams out on course and started our ride with a small group from Fort Lewis College. The start of the course was a nearly 3 mile long climb to the very top. The climbs were wide open with dry, dusty soil conditions. Tim and I had gotten away from the rest of the group on the climb and we were both feeling well. While we waited for the group we had a good conversation with some of the Fort Lewis riders. After a few minutes we were all back together and climbing again. At the top of the climb the course turned into pretty technical singletrack section which took me two tries before clearing it without dismounting. After the technical section, there was one more small climb and then a fast descent back to the bottom. The decent was littered with switchbacks and had some pretty sweet flow to it. Four laps were definitely going to make a brutal Friday. We all got back from our practice rides that day and had some delicious food cooked up by our coach/head chef, Hugh. Friday morning came quickly and the start of the Division II Men’s XC race was at 9:10. Tim was in the very front row, followed by Corey in the second, Tyler in third and me in fourth. The starting gun fired and everyone was off. Immediately there was a crash involving two to three riders. Fortunately Tim, Corey, and Tyler were able to maneuver around it. I got caught up behind it and was nearly involved in a second crash. Panicked, I hit the first corner and promptly downshifted sending my chain deep behind my cassette, all within 100 meters of the start. My race was over and I was forced to drop out. Disappointed beyond belief I went back to the condo, changed, got my camera and headed out on course to cheer on my teammates. Tim was having a stellar race, and Corey and Tyler were both putting out great efforts. Four laps later saw Tim rolling into a solid 5th place finish, Corey in 29th, and Tyler as 51st. Super proud of those guys. The DII women’s race went off at 12:10 with our very own Laura Rice and Catherine Harnden representing Mars Hill. I only saw Laura once as I wandered from one spot to another but I saw Catherine all three times and at the start of her third lap, when she looked like she was in the most pain, I yelled “Keep It Crispy, Catherine!” That became my phrase for the weekend. Both ladies rode a great race with Laura finishing 19th and Catherine in 26th. 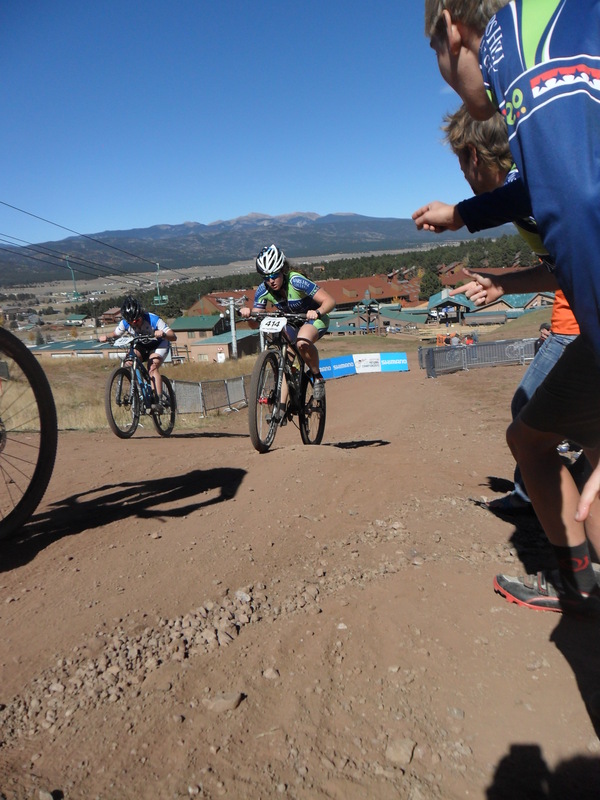 Downhill qualifications followed the days XC racing. I was the only one on the team to not race the gravity events so instead I went and got some pictures of the team. After a hard day of racing we got some relaxation in and another great dinner made for us by Hugh in preparation for Saturday’s short track cross country race. All for one: the men cheer on Catherine in the cross country. The STXC race wasn’t supposed to go off until 10am for the DII Men and 12pm for the DII Women. It was time for the men’s race before we knew it and we were in the same order as the day before. Tim and Corey both had great starts while Tyler and I worked to fight our way from the back. At the start of the singletrack portion of the course the group began to bottleneck but I managed to fight my way through to get one person between me and Tyler. As we came back through the start I passed who was separating us only to take the sharp left corner a bit too fast. I went over the bars and had to run up the hill. Tyler got away from me and I ended up getting pulled. Tim finished 9th, Corey 20th, Tyler 43rd, while I was back in 56th. DII Women went off at 12pm with a strong looking field. Laura was in the very front row and had a fantastic start. Catherine was just behind her and killed it as well. Each came through lap after lap seeming just as strong as they were at the start. Towards the end Laura came into the same corner a little too fast and nearly crashed but was able to recover and run the hill while the Mars Hill men cheered her on. Catherine had a great race using Corey’s BMC as well finishing in 18th place, while Laura came in just behind her in 19th. Later that same day was the Downhill race. The DII Men and Women were both scheduled for a 2pm start. I made my way up to a great spectator spot; a steep, fast downhill right into a double. Our team as a whole was definitely the cleanest through that section. Props to Catherine for the cleanest ride through there of any of the ladies I saw go by. There were plenty of guys and girls that took a pretty nasty spill there. Mars Hill did a great job with Tim in 24th, Corey in 27th, Tyler in 30th, and Alan in 31st, Catherine on the podium in 5th, and Laura in 9th. Following DH was Dual Slalom practice. The team was looking fresh with Alan getting some great runs in. We were all excited to see Alan tear it up the following day. Unfortunately Alan took a pretty nasty spill right near the end of the course during a practice run. The medics on duty were quick to respond to his fall and check him out. They gave the opinion that Alan should probably go to the hospital in Taos. Turned out to be a good decision, he ended up having a mild concussion and some fractured bones in his wrist. Luckily, Alan was discharged the same day and was back during the banquet dinner and awards ceremony. Chairlift rides to the top of the mountain. What a luxury and what a view! Sunday came with only the dual slalom races to complete. With Alan sidelined our men’s team was represented by Tim, Corey, and Tyler. Everyone had a solid run, despite Tim crashing hard in nearly the same exact spot as Alan had the day before, on the same exact bike. Tim was pretty positive: he separated his shoulder but completed one last run regardless of his injury. After that I deemed Alan’s bike “The Cannibal”. Corey and Tyler demonstrated their former motocross talents during the race with a respectable finish from both. Catherine and Laura did a great superb in the DII Women’s field. They showed no fear and attacked every corner. Results ended up being Tim 12th, Corey 16th, and Tyler 31st. Catherine earned herself a podium spot in the second gravity event in 5th, and Laura representing in 12th. Awards were the final installment of Nationals. 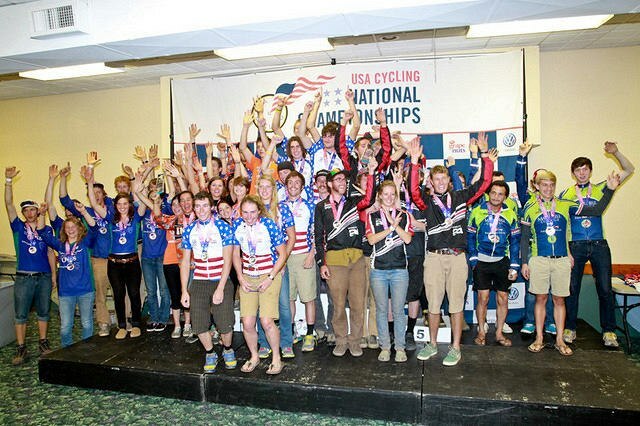 Gravity riders, Individual, and Team Omniums were the focus of the award ceremony on Sunday. Catherine was the only Mars Hill rider on the podium for any gravity events, DH and DS. After a solid showing all weekend long, Tim was awarded 3rd in the DII Mens Individual Omnium, with Corey not far off at 7th. Our team ended up taking 5th place in the DII Team Omnium so we all got to head up onto the podium. When the award ceremony was over we headed back to the condo to relax. The team came through with outstanding DH and DS performances. Mountain Bike Nationals was by far one of the best events I attended this year. Our team put in the hard work and it showed. Despite the bad luck here and there we pulled it together and got that 5th place spot. There’s no doubt in my mind that Alan would have won DS had he gotten the chance to race. But there’s always next year for that. Another big shout out goes to our SECCC rival Brevard College, for having riders win the cross country and short track races, and to the team for taking 1st in the DII Team Omnium. The D2 team omnium. Congrats to Brevard on the victory. Also to Union and Warren Wilson. Four SECCC teams on the podium! 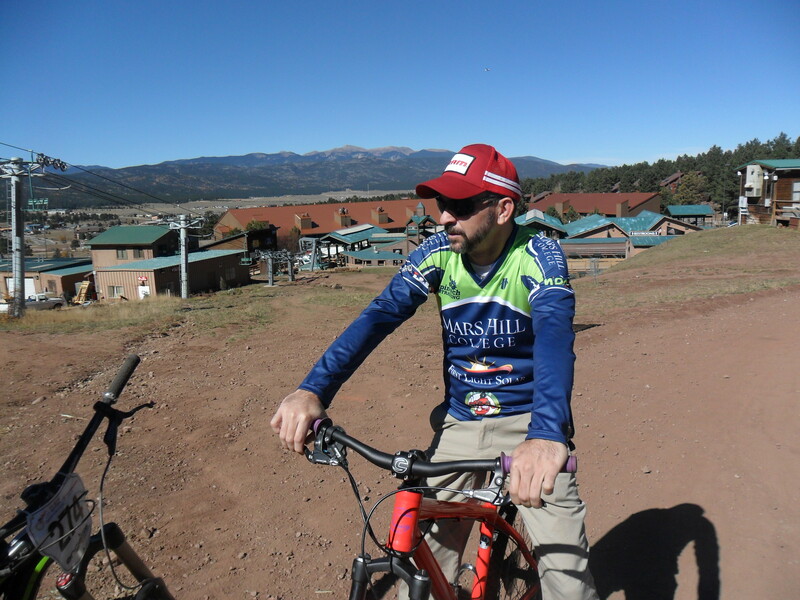 We want to thank our school, all of our great sponsors, USA Cycling, the event promoters, all the volunteers, Angel Fire Bike Park, the entire town of Angel Fire for welcoming such a cool event, and to the medics for piecing members of the team back together. We also want to thank Hugh for all the hard work he does for us as coach. We really appreciate it. And as far as next year is concerned we will be back, and that DII title will be ours. 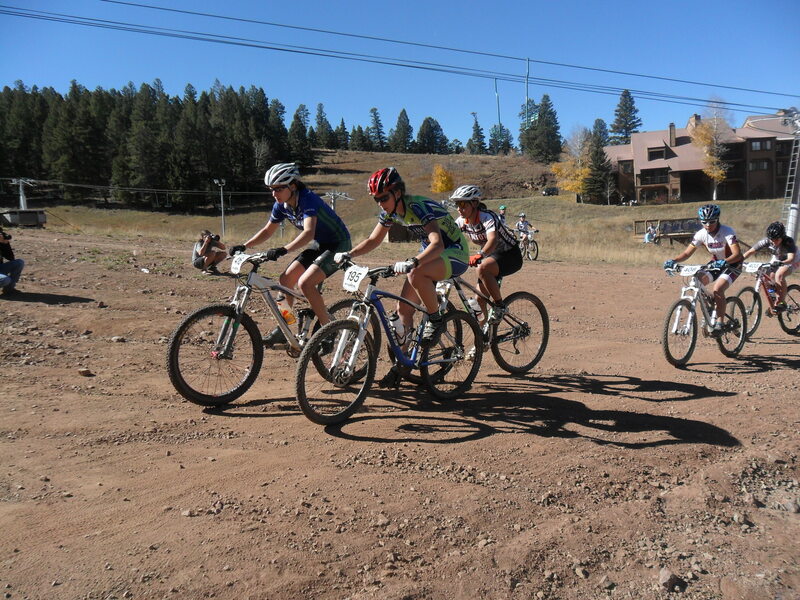 Remember to keep up with us as we move into cyclocross season, and come on out to our cyclocross race on December 1st. And like always, Keep It Crispy.